Every Christmas Eve, Maggie has the same dream. Santa is walking on the top of her grandfather’s manor, when suddenly he slides off the end. But this year is different. This year, it’s a nightmare in which he is pushed by something sinister. Awakened from her dream, she decides to go sledding – ending up in an accident that leads to meeting the handsome (but older) Henry. Henry has come with strange claims: that Maggie’s grandfather, who is well known for writing the poem ‘Twas the Night Before Christmas, had plagiarized his poem. While exploring the mansion for proof of plagiarism, Henry and Maggie are accidentally swept into a strange underground village named Poppel – a village strangely resembling Santa’s fabled home. But not all is right in Poppel. It is ruled by tyrants called the Garrison, and Nikolaos is missing. She and Henry must find three hidden objects before the end of Christmas Eve, or else Maggie, Henry and their families are in terrible danger – as is the hidden village of Poppel. This was a refreshingly unique story based on the poem ‘Twas the Night Before Christmas and Alpine German folklore of the anti-Santa named Krampus. Who knew a world could be built just around such a short poem? 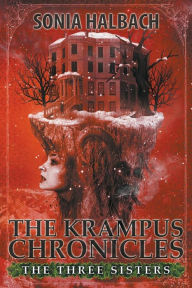 And I’d never heard of Krampus before reading this book. (Of course, just yesterday I went to the theaters and found out that a movie named Krampus is soon to be released, though there seems to be no relation between the two.) I really enjoyed reading this book. It was cute, adventurous, and had a tad of romantic tension. And one thing I really loved about this book is that the story was complete at the end. That is the perfect beginning to a series, as far as I’m concerned. I will definitely watch for the next in the series.